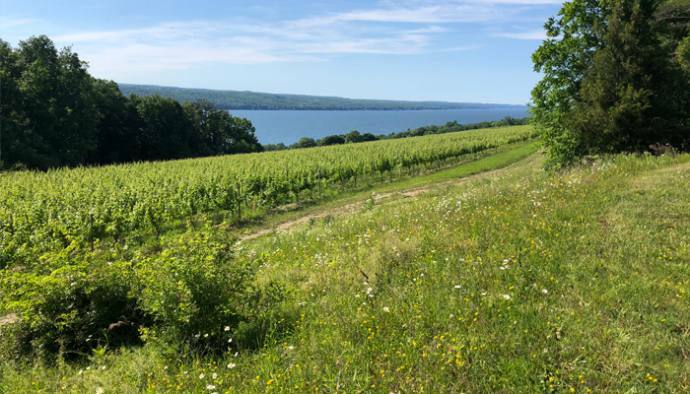 The boss of the Finger Lakes, Seneca Lake occupies center stage and takes its name directly from the Seneca Native Americans, likely because they revered it so much – for its size, mystery, and grandeur. 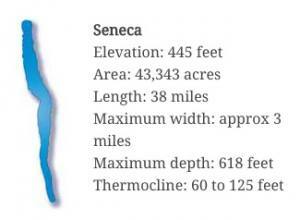 As the namesake of the Seneca Native American tribe, its largeness is more than physical. “Seneca” comes from the Native American word “assiniki,” which means “stony place,” possibly referring to the steep, stony southern shoreline or to the many rocky streams, gorges, and waterfalls that feed into the lake. It’s so deep that the Native Americans are said to have believed it was bottomless. It holds over half the water of the entire Finger Lakes Region. Because of its size, it rarely freezes over completely; the last time was in 1912. The lake’s size moderates the surrounding temperature, making it ideal for the many vineyards sprouting up around it. It’s known as the “Lake Trout Capital of the World” and it’s home to the National Lake Trout Derby, which takes place every Memorial Day Weekend. Since 1964, it has served as a competition for who can catch the heaviest fish, open to all with a New York state fishing license. 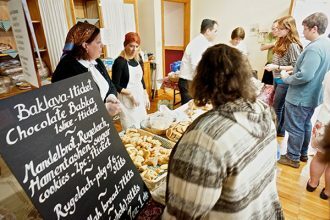 Last year, 1,024 people registered; the grand prize this year will be $10,000. The largest fish caught by a grand prize winner was 18.49 pounds by William Ryan Jr. from Auburn in 2016. Many people hear mysterious distant “booms” across the lake from time to time, known as the “Lake Drums.” Some think they sound like cannon fire, and others think they are a message from the Native Americans or lost Revolutionary War soldiers. The Native Americans themselves are said to have believed the sounds came from evil spirits, drums of their ancestors, or the Great Spirit’s curse on those who violated scared laws. The scientific explanation is that these noises are due to natural gas bubbles escaping from layers of sandstone. A number of boats that would transport products and people across the lake in the 1800s now lay at the bottom. Scuba divers still enjoy exploring their preserved remains, with many at the southern end. During World War II, Navy soldiers were trained here, and the lake has been used to test submarines. The lake is distantly connected to the Atlantic Ocean through a system of canals. Today, several companies offer relaxing boat rides open to the public. Captain Bill’s Seneca Lake Cruises, a family-owned business, offers both sightseeing cruises and large dinner cruises, some with live music. Schooner Excursions offers more intimate public or private chartered rides, and Seneca Wine Boat Tours offers small tours for up to six at a time. Like a few of the other Finger Lakes, Seneca has its own legend of a sea serpent lurking beneath the water. Unlike those in the other lakes, one reported sighting of this monster had a large number of witnesses to support its credibility. On July 14, 1899, from his passenger steamboat Otetiani, Captain Carleton Herendeen is said to have spotted a large moving object that turned its head and flashed its sharp teeth as the captain prepared to ram into it. 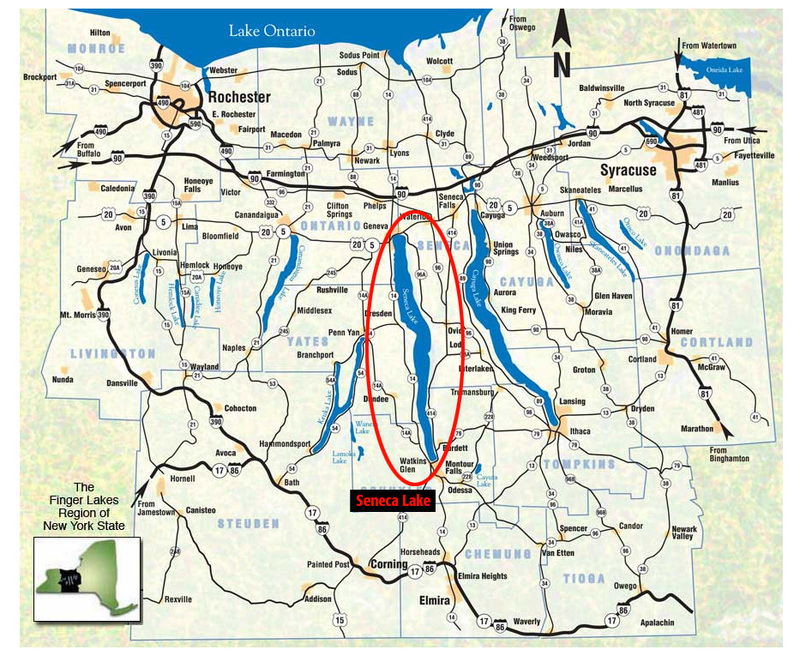 Other legends say there are secret passageways connecting Seneca to Cayuga Lake, through which sea serpents of the Seneca Lake family have spread. From 1994 until 2006, the Seneca Lake Whale Watch Festival poked fun at the lake’s mysterious depth, humorously wondering if there might just be whales under the surface that traveled in through the networks of canals from the ocean. In reality, the most common fish other than lake trout to inhabit Seneca Lake include smallmouth bass, yellow perch, rainbow trout, brown trout, and landlocked Atlantic salmon. Numerous sites allow convenient public access around the lake, such as Seneca Lake State Park and Sampson State Park in Geneva, Lodi Point State Marine Park, Smith Memorial Park in Hector, and the harbor in Watkins Glen.